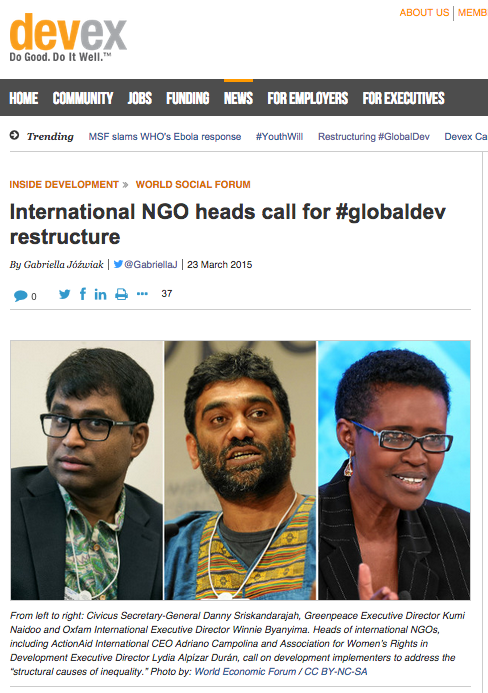 "Heavyweight global development leaders will call for a “tectonic shift” in the sector’s approach to development at the global civil society activists’ WorldSocial Forum meeting in Tunisia this week. The heads of ActionAid International, Oxfam International, Greenpeace International,CIVICUS and Association for Women’s Rights in Development have together committed to adapting future work toward strengthening the power of the poorest people to challenge the wealthiest 1 percent in the world. In a statement of intent published today, March 23, the group argues development implementers need to go “beyond tinkering” and address the “structural causes of inequality.” They warn governments across the world have fallen under the influence of corporations that have convinced them to allow actions that damage citizens, such as land grabs, tax avoidance, climate destruction and clamping down on nongovernmental organizations, civil society and unions because they threaten corporate power..."
I just like the valuable info you provide for your articles. I’ll bookmark your weblog and take a look at once more right here regularly. Custom essay writing service will give you opportunity to spend more free time with friends.